The Los Angeles Beat blog compiled an amazing list of LA and environs’ oldest surviving restaurants, organized by year of opening. Oldest: Santa Clarita’s Saugus Cafe, 1905. A number of Inland Valley restaurants are on the list, including Sycamore Inn (1939), Vince’s Spaghetti (1946), Magic Lamp (1955), La Paloma (1966) and more, even if they can be hard to spot in scrolling. See the list here, and congratulations to Nikki Kreuzer for the labor of love in putting it together, and in adding to it based on reader comments. Wow! Kudos to her–what a project! My favorite, “Phillipe the Original” is still alive–simple, delicious comfort food–non-interesting building. I have eaten at the Original Pantry–thought it was quite over-rated. What is odd for me about the list in the Inland Empire, is that we have never eaten at the “Magic Lamp”–don’t know why. We used to eat weekly at La Paloma–I’m almost afraid to go there now; I’m sure it won’t be the same. In the late 50’s we had Mrs. Knott’s fried chicken at Knotts Berry Farm–it was the best fried chicken I ever ate in my life! We tried to duplicate the experience there in 1996–it was not the same! Sometimes you can go “home” again, sometimes you can’t. It probably helps if you’re a regular somewhere, because the changes may be so gradual you overlook them or adjust. If you only go every few decades — watch out! I had never eaten Mexican food where I grew up in WY. When I came to L.A. I visited my aunt who lived in a beautiful apartment area (I think it is now Korea Town.) She would go to work at the DWP and I would go alone on the red car for about 11 cents to Broadway where I shopped at Bullocks had lunch at Cliftons. There was a waterfall in there, and what did I eat? Enchiladas. I love to dine at Musso and Frank when I am in Hollywood to see a show at the Pantages. It is still “old Hollywood”. I had a favorite vegetable dish, with all kinds of cooked vegetables fixed like a wheel around a mound of mashed potatoes. Then they discontinue that–so I picked a low calorie meal, ha-ha, huge hamburger patty and cottage cheese. Then they discontinued that, and I could only settle on cream of tomato soup, one of my favorites also with their delicious sour dough bread. While waiting for that order I glanced at the menu again and discovered there is a $10 minimum charge per person–I had not ordered enough. When the waiter came back I told him I would have to choose another item to meet the minimum charge and he said no, I was a nice lady and that was alright. I will be sure to pick something that meets their minimum next time. I always hope to see a movie star sitting at the counter. Two other L.A. eateries still on my restaurant bucket list are El Cholo on Western (green corn tamales) and Taix. I think I learned of it from one of your earlier blog entries. It is certainly worth repeating for those who’ve been in this area a while. 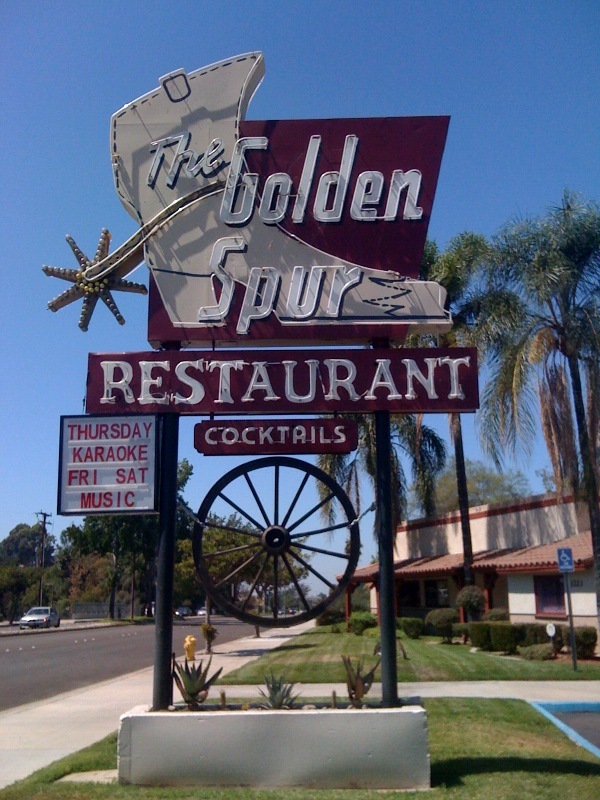 The “Spur” was my parent’s favorite hangout (along with the Dinnerhorn, not the one in Pomona which became Roddys, but the one in West Covina which is now North Woods) when I was growing up. Never been there myself. However of the oldest restaurants I’m actually surprised how many I’ve actually eaten at. I guess in 6+ decades one gets around, especially if lead by their ample bellies.